Portal hypertension is the medical term for elevated blood pressure with the major vein of the liver, the hepatic portal vein. Although it is most commonly caused by liver cirrhosis, it can be due to a number of other causes that may not even involve the liver. Therefore portal hypertension is an important clinical sign of a wide range of diseases. In the long term, the prolonged hypertension can cause a host of complications within the liver and entire body, some of which can be life threatening. 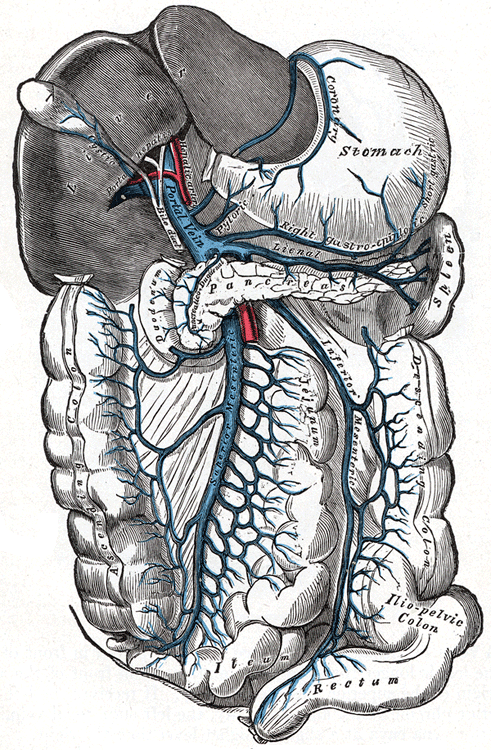 The hepatic portal vein is the major vein that carries blood to the liver. Blood from various parts of the gastrointestinal tract drain into the portal vein. In this way nutrients from the gut can be processed by the liver. Similarly toxins that are absorbed from the gut are first filtered by the liver before the blood empties into the systemic circulation. The portal vein originates behind the pancreas in the right upper quadrant of the abdomen. It measures about 8 centimeters (about 3 inches) in length. The portal vein also communicates with other veins draining blood from various organs in the pelvis, abdomen and even the thoracic cavity. Blood that filters through the liver then exits through the hepatic veins. It empties into the inferior vena cava which then carries the deoxygenated blood to the right side of the heart. Prehepatic when the problem lies before the blood reaches the liver. Intrahepatic when the problem is located within the liver. Posthepatic when the problem lies after the blood flows out of the liver. The normal blood pressure within the portal vein is around 5 to 10 mmHg. Blood drains through the liver sinusoids where it filtered by the hepatocytes (liver cells). Portal hypertension is mainly due to an increase in resistance to blood flow or an excess of blood flowing through the vein. For example, in cirrhosis which is the most common cause of portal hypertension, there is increased resistance to blood flow within the liver sinusoids as a result of the tissue damage and swelling. The elevated blood pressure within the portal vein has several consequences. Firstly blood may be shunted through collaterals leading from other organs. This causes these collateral veins to become engorged. The dilated veins may then rupture leading to bleeding within the abdomen or within the organ. Secondly, in portal hypertension blood can be rerouted through collaterals that communicate with the systemic circulation allowing toxins to bypass filtration in the liver. Portal hypertension on its own does not cause signs and symptoms. The complications of portal hypertension may be symptomatic. Similarly the underlying cause of portal hypertension may be symptomatic. Fluid accumulation within the abdomen (ascites). Brain dysfunction (encephalopathy) marked by difficulty concentrating, poor memory, irritability, problems with sleep and confusion. Abdominal pain and sometimes visible veins on the surface of the abdominal wall. The cause of portal hypertension is extensive. Cirrhosis, the most common cause of portal hypertension, is a condition where there is scarring of the liver usually due to chronic liver disease. Some of the common causes of portal hypertension includes viral hepatitis (B and C), alcoholism and non-alcoholic fatty liver disease. There are various other causes of cirrhosis including infections, parasitic infestations, autoimmune diseases, metabolic disorders, iron overload and heavy metal toxicity. Apart from cirrhosis there are several other causes of portal hypertension, which may not be as common but is nevertheless significant. These causes can be listed by its location – prehepatic (before the liver), intrahepatic (within the liver) and posthepatic (beyond the liver). Blood clot (thrombus) with the portal or splenic vein. Abnormal connection between an artery and the portal vein – arteriovenous fistula. Tumors that compress the portal vein. Very enlarged spleen (massive splenomegaly) due to some other cause which is not a complication of portal hypertension. Parasitic infection like schistosomiasis (Schistosome worm infection). Bile duct destruction (primary biliary cirrhosis). Cirrhosis due to any cause. Unknown causes (idiopathic portal hypertension). Diseases that cause the formation of granulomas, like sarcoidosis and tuberculosis. Liver cancer including spread of cancer from elsewhere to the liver (metastasis). Cysts in the liver with diseases like polycystic liver disease. Blockage in the hepatic veins exiting the liver. Obstruction within the inferior vena cava (IVC). Endoscopic treatment for upper gastrointestinal varices include banding or sclerotherapy. Repeat endoscopy needs to be conducted at regular intervals to asses the condition and identify any new varices. In the event that these measures are not able to yield the desired results and treating the cause is not successful, other treatment options need to be considered. The two procedures that may be conducted includes a transjugular intrahepatic portosystemic shunt (TIPS), where a stent is placed in the liver, or a distal splenorenal shunt (DSRS) where the splenic and left kidney veins are connected to reduce pressure.